We've seen some inventive guitar designs over the years, but Bergstok Music's AxeM and R103 feature perhaps some of the most practical alterations yet, with modular pickups, a built-in stand and reversible hardware for easily stringing the models right- or left-handed. The modular pickup design utilises a steel plate, which the pickup frames are attached to magnetically, and can be moved and replaced with ease, while pickup configuration and channel assign switches can also be housed in pickup frames. Both right- and left-handed guitarists can play the guitars, as the bridges and nuts can be reversed, and future versions will feature swappable volume and tone controls, too. A magnetically latched and spring-assisted kickstand means the guitars can stand on their own as well, while the bodies feature three layers of ash/maple/ash for a 3D-like effect. 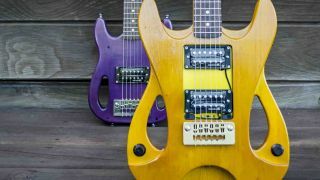 The models are the work of Wisconsin's Sean Berg, who is seeking funding for the guitars via Kickstarter - pledging $1,500 secures an AxeM or R103. See Bergstok Guitars for more info.